Toddlers have this beautiful and natural ability to fully live in the present moment. From embracing play wholeheartedly, feeling so much love for you and all the way to those big, teary, tantrums, toddlers feel everything just so intensely. And this is actually a good thing as far as developing in a healthy way. Sometimes though, toddlers need some guidance finding their way back to calm. I don’t reccomend distracting children away from their feelings, but instead, taking time to teach calming skills that toddlers then feel safe and secure engaging in when they are begining to feel overwhelmed. Here are two yoga based games that can help children feel more centered and calm. These games also help toddlers feel connected to you – a central component to feeling and doing well. You don’t need any sepcial yoga experience or training to play these games. The Vibration sensation in this humming game has a fantastic calming effect. It’s a great game you can teach your toddler when she is calm. And later play while waiting in lines, sitting in the car or waiting for an appointment to help pass the time and help your toddler stay calm and connected to you. How to Play: Invite your toddler to be a buzzing bumblebee. You can model the humming sounds first and then invite your toddler to follow along. Beyond the humming noise, if you have space you can add in body movements such as flying, bouncing, landing, and smelling roses. When I play this game with my children, I like to invite them to feel their face as they hum and to observe how their face is soft. Together, we buzz loudly, buzz softly, buzz very quietly, breathing deeply in between and invite the busy bee’s to think about how they are feeling. Sometimes we fly and buzz into a hive for hugs and kisses too. 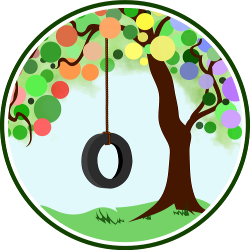 The seesaw is a work-together style game. And toddlers love team based games with parents as it helps them feel cared for and gives them a sense of capability too. How to play: Sit facing each other, legs placed straight and feet touching. Let your child explore your feet with hers. Lean forward and take each other’s hands. If you can’t reach, that’s okay, place your legs into a V formation and bring the child closer. Arms stretched, hand in hand, slowly seesaw back and forth, taking nice breaths as you move together. Next, take turns pulling each other forward, as far forward as you can go, pausing as you try to touch your nose to your knees as far as you can, gently so as to not stretch too quickly. When I play with my children we like to sing or say See. Saw. See. Saw. as we move. This can bring on giggles to release pent up emotions. Or when said softly can be very soothing and calming. I remember playing the see-saw game one time while waiting for a doctors appointment that was taking unusually long to start. My son was 2.5 year old at the time and wasn’t really interested in the books in the waiting area any longer. Instead of looking at the books or asking me to read them, he had started to knock them down. It was clear he was running low on “calm.” So, I sat him across from me, and after setting a gentle limit (I will not let you knock down the books) I offered an alternative. We played a quiet and mini version of the see-saw game. The time passed quickly, we were both very engaged with each other and as a bonus, his check up was a breeze. Taking some time to play, giggle and connect before the check up was an important step in helping my toddler get back to feeling calm. 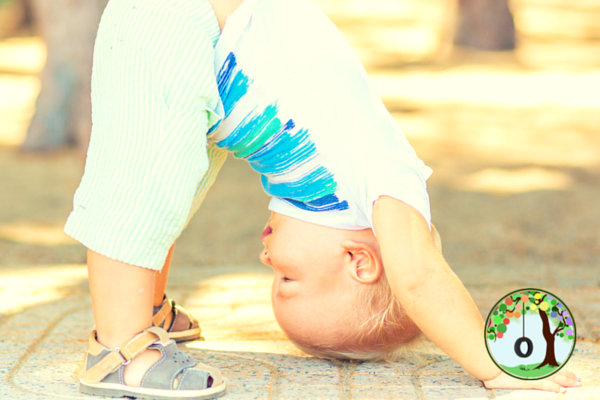 So do you have any yoga based games you like to play with your toddler? I love this article! I’ve finally gotten back into doing yoga with my 13 month old son, and it’s such a great way to bring focus and physical activity together. These ideas and instructions are so informative and unique, thank you for the great post!